They hold an annual Dyspraxia Awareness week during early October to help boost the understanding. Along with awareness, the people at the Dyspraxia Foundation decide on a theme that they like to concentrate on and this year they have gone for primary aged children. In my last post, I wrote about the hardships of the depression I had over the course of my school life – where I briefly covered my primary school experience. I think this is a prime opportunity to explain in more depth my primary school experience and why it is important for the staff in the school environment to be well informed about Dyspraxia. I was held back from school for a few terms because I wasn’t ready as there was a delay in my speech – whether this is related to my Dyspraxia or not I’ll never know, but it is probable. After some 1-to-1 sessions with a speech therapist, I was ready to attend mainstream school – however because of how late I was at joining I started in the year below what I should have been. From the start, I was different, more awkward and shy than the rest of the class and didn’t make friends as easily as the others. (Didn’t make any friends at all). After the Christmas break, I was pushed up a year because it was felt that I would be able to cope. I felt my school work was average but the updates from teachers throughout my school life were along the lines ‘Robert is a very bright student, but is lazy. On Friday’s Robert is especially tired’ I know at school I tried my absolute best but wasn’t getting the deserved output. I felt my school work was average but the updates from teachers throughout my school life were along the lines ‘Robert is a very bright student, but is lazy. On Friday’s Robert is especially tired’ I know at school I tried my absolute best but wasn’t getting the deserved output. There were obvious issues that the teachers were, ironically, too lazy to look into. It wasn’t until I was about 8 that the school nurse picked up on my clumsiness in PE lessons. She was aware of what Dyspraxia was and saw I had very similar traits to it, and she started the ball rolling. After several tests and discussions from a specialist, it was confirmed that I did indeed have Dyspraxia. The school did nothing to support though, despite the diagnoses. I had a label that confused me within a school environment that was still too lazy to help and would rather brand me as ‘lazy’. Quite honestly it isn’t rocket science to understand why my self-esteem was so critically low at the time. There are two vital reasons why teachers and school staff should be aware of Dyspraxia. (1) Identifying it. If it hadn’t been for the school nurse with a personal understanding of Dyspraxia I may never have been diagnosed. School children spend most of their life at school, and as such teachers may well be the people that pick up on the certain traits, report it, and assist the pupil getting a diagnosis. (2) Support and Understanding. Identifying Dyspraxia is one thing, supporting the person is another. Specific and reasonable changes or assistance must be put into place to help the child as much as possible. Even if no changes can be made a different attitude would help tremendously. I would have had a better mindset if the teachers were not so quick to brand me as lazy. After all, they were quick to pick up that I had potential – but I ended up getting repressed and not understanding my own potential until I left school. When I first started my Business Admin Level 3 qualification my tutor handed me a Dyslexia questionnaire which also incorporated Dyspraxia related questions. After completing I praised the document to the tutor for having Dyspraxia and also found the opportunity to explain my own Dyspraxia and the extra support that I may need. She told me she had never heard of Dyspraxia! There were other issues with this tutor and so the company I was working for at the time requested a different tutor. Either she was completely ignorant or the college wasn’t providing well-informed information. The college is one of the highest and most respected in my city, so I feel it’s going to be the former. With so many disabilities and conditions out there it is hard to be knowledgeable in all of them, but Dyspraxia is one of the main ones. Considering that on average there is one in every classroom, and affects the same amount of people as Dyslexia you would think there would be more effort made. Awareness isn’t just for teachers though, because I feel even making pupils aware of different disabilities will help. If pupils understand that hidden disabilities exist early on then they can be more tolerant to those who have Dyspraxia, Dyslexia, Autism, etc. With that understanding, they may be able to help those pupils out. I had a secondary school teacher declare to my face that Dyspraxia doesn’t exist. Ignorance is certainly a major barrier and needs to be tackled. Dyspraxia awareness week is the battering ram to that barrier and with it hopefully, ignorance can be beaten. Once ignorance is beaten a foundation can be made and then built upon. The education system should be a bit more flexible to accommodate individual needs. While I don’t post that often, most of the time I’m improving my current pages with additional information or tidying it up. 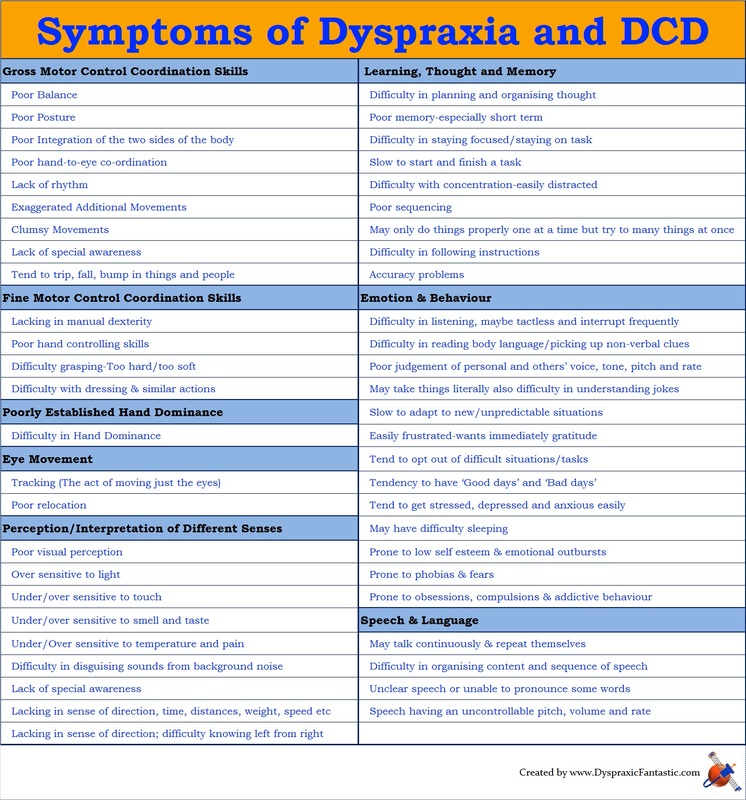 For example, the original table about Dyspraxia Symptoms wasn’t easily viewable on some computers and devices, so hopefully, this image format is easier to read and share. I’ll continue to tweak pages to improve them until my next idea of a project or post.